Our note: chorizo rustic buns are the ideal snack for a picnic lunch. 2. Knead the sponge in the bowl for 2 minutes. 3. Let rest at room temperature, covered, for 3 to 4 hours, or overnight. 4. Place the sponge, water, fresh yeast, flour and salt into a large bowl. Mix the dough ingredients together. 5. Knead the dough in the bowl for 8 minutes. Let rest into the bowl at room temperature, covered withcling film, for 2 hours. 6. Turn the dough out onto a lightly floured surface, and form it into a ball. Add some flour, if it is necessary. 7. Divide dough into two pieces. Stretch the pieces by hand, put in the center of each piece the whole chorizo and close the bun leaving closing down. Our note: You can divide the dough into as many pieces as rolls you want, then cut the chorizos into thick slices to fill the buns. 8. Place them on a parchment-lined baking sheet. 9. Cover the buns with a dish towels and let it rise in a warm spot for 2 hours, until doubled in size. 10. Uncover the buns, use a sharp knife and slash the top of the loaf (1cm deep approx.) 2 times and lighty dust the top with flour. 11. Preheat the oven to 220ºC. Bake the bread for 20 minutes. After 20 minutes lower the temperature to 190ºC and bake the buns for 20 minutes, until golden brown. 12. Remove them from the oven and place them on a rack to cool. 13. Eat a bun or cut it into pieces if you are going to share. 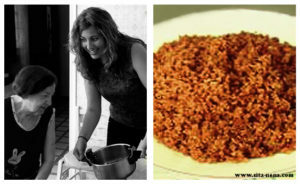 Our note: If you don´t have chorizo or vegan chorizo at home, no problem. Rustic bread is exactly the same recipe (obviously without filling). There’s nothing better than a warm loaf of bread. Mmmm, let´s bake it! Bollo preñao (Wikipedia, the free encyclopedia) is a rustic bun filled with chorizo or pancetta. Commonly served as an appetizer during the spring and summer festivities in Galicia, Asturias, Cantabria, La Rioja and other places of Spain. Served with wine and/or cider. Choripán (Wikipedia, the free encyclopedia) is a type of sandwich with chorizo popular in Argentina, Bolivia, Chile, Guatemala, Peru, Puerto Rico, Uruguay and Venezuela. The name comes from the combination of the names of its ingredients: a grilled chorizo (sausage) and a pan (crusty bread) such as a marraqueta or baguette. In the U.S., they are commonly available at lunch counters in Miami’s Cuban diners and cafes, where the sandwich is customarily served on Cuban bread and topped with raw or fried onion and popularly eaten with a tropical fruit shake. A menu of creative and healthy recipes has been prepared for each month of the year. Are you ready? Cosericantar cooking blog makes it a piece of cake with lots of homemade recipes (vegan friendly) and special menus (Halloween and Easter). Mix and match recipes as you wish for your everyday meals!